Camping equipment list for the Campsite trip. A camping equipment list is certainly a must prior to your first trip, but do you really know what equipment to take along? My wife Irma and I are certainly not experts, however we have camped for over 40 years and backpacked for a few. We Feel we know enough to help with a little advice for what equipment we have used and recommend. Most of our camping has been in BC campgrounds and BC Parks. Camping is a lot different than backpacking due to the weight and size restrictions for backpacking. The most important item on our camping equipment list is our tent. If it doesn’t do the job for you, your trip is ruined. Click here to take a look at our tent page. There are all kinds of tent pegs. Most are useless. Try hammering a plastic peg into rock hard ground. The best we found were an 8” steel spike with a plastic gadget on top for holding the tent tie down. They do the job. They will not bend. A good nights sleep sets you up for the coming day. Toss and turn all night and you will wake up cranky and ruin everyone’s day. Your Sleeping Bag is really important. This type of mummy bag is designed for camping in really cold climates. They are a little too much for summer camping for our liking. We purchased $40.00 rectangular bags and they were perfect and lasted us a long time. It doesn’t matter what covers you so much as to what is underneath that dictates if you have a good or bad sleep. 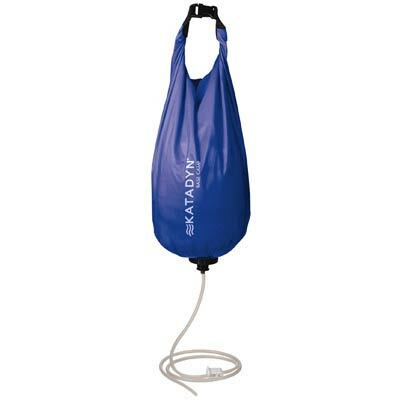 Backpacker self inflating pads are perfect for backpacking, but not for camping. Give us 3” of closed cell foam to sleep on and we were in heaven. Two things about the foam. Will it fit in your vehicle? Does it have a cover. We bought one from a foam store and the cover came with it. Air mattresses are good for the kids as they will sleep through anything. Once they go to sleep, they are gone. Adults are different. The slightest movement and we are awake for the night. That’s the problem with air. When a couple sleep on a double air mattress, everything is fine until one person moves. The other bounces too. Foam is our choice by far. We salvaged four foam cushions from a travel trailer years ago. They fir into our 3 person dome tent. We zippered two sleeping bags together. That sleeping arrangement was perfect. We carried another bag to lay over the top as we drove across Canada to the Yukon. It got pretty cool some nights. One night it was cold enough to freeze Muncho Lake, a beautiful camping area near The Yukon border. That extra bag was worth its weight in gold. Problem with this type of stove is the gas bottles. They are costly and don’t last very long. We don’t like to use them because it’s something else to clutter up the landfills. However, you need a couple as a backup for your larger tank. We bought an 8 pound propane tank (a lot smaller and lighter than the 20 lb. used on barbeques) and the fittings along with an eight foot hose. Perfect. You can have them filled at your service station for about $3.00 and they burn forever. If they go empty during dinner, change over to the small bottle until you have it refilled. An affordable family vacation is to consider camper trailer rentals or you might consider to build your own camper. You might buy hiking gear and head off to North Georgia camping along the way. If you want to head into Canada you might consider taking a northwest territory tent trip or a self erecting tent would be handy. You will want to check the rv campground directory for the rv camping sites in the area. Since it a cool section of the country you should be prepared for rv winter camping. Screen tents are something you might want to take along as this is mosquito country. Someone should invent a self erecting tent. Perhaps we could put it on our rv camping checklist along with magnesium fire starter and a new set of Goodyear trailer tires for our 4X4 motorhome. Our first trailer was a great little Boler all of 10 feet long. It served the purpose. Now for other essentials on your camping equipment list. Looking for a vacation checklist for your camping holiday? This free printable Camping Checklist has been used to ensure that family holidays include everything, including the kitchen sink! Buy a good axe. Large chunks of wood are tough to split with a small hatchet. The hatchet is great for splitting kindling to get your fire going but a good axe can really take care of the big stuff. We purchased a Swedish buck saw with large teeth. Perfect for cutting pieces of wood too large for the campfire. Fire starter sticks are a very good item to have. They come in a package of 12 in the camping supply section of your hardware store. Half of one of these placed under the kindling will get you a roaring fire in jig time. Even with damp wood. 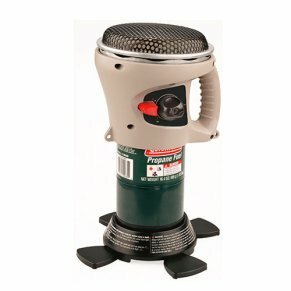 While at the camping store, pick up a pot gripper. 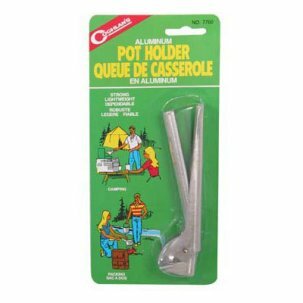 It is a two part aluminum handle for picking up a hot pot off the camp stove. A very handy item. Bungee cords are a must. Hold you vinyl table cloth in place with them. Paper plates eliminate washing dishes. We lived on the west coast for years. Many called it the “wet” coast. Rain was something dealt with. We had to be ready. Nothing can ruin a camping vacation as fast as wet clothes, sleeping bags and tent. We found that out the first time we camped near Vancouver. Driving through the campground we saw more tarps than we could imagine. Why, we thought? Rain, we found out. We went out and bought a large orange (lets in more light) tarp and lots of light weight rope. Other campers told us to avoid the tarp clamps as they will tear out the corners. We bought a 12 foot telescoping aluminum pole. This was really handy for keeping the tarp up high out of the way. No camping equipment list would be complete without folding chairs, flashlights, long fire lighters, newspapers for lighting the fire, a claw hammer. 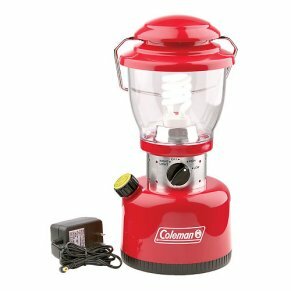 Add one of these rechargeable lanterns to your camping equipment list and solve the mantle problem We bought many types of lanterns over the years. Every time we went to use them either the shade or the mantle was broken. The mantles had a way of hiding somewhere and never could be found. Propane lanterns can be purchased with their own carry case, but they still have that mantle to deal with. Every camper has experienced one of those days that goes from bad to worse. Rain overnight, continues the next day. 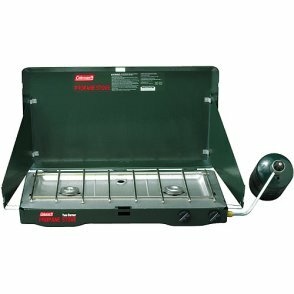 Just to be safe and to keep your sanity your camping equipment list should include a heater to take the chill off while you are trying to decide to leave or hang on for another night. This type of heater will help to keep the chill off. A word of caution. Any device that has a flame will take oxygen from the air and may emit CARBON MONOXIDE gas that can kill. If used in a tent you must keep the ventilators open. Never close everything up. Water is the nectar of life. It is not always pure unfortunately. You may not be safe drinking the water in campgrounds or while visiting other countries. Boiling water fro five minutes will kill most bacteria, but what if one of the kids wants a drink NOW. This is a must for your camping equipment list. Here is the answer. Gravity purifier. Just fill it up with 10L (2 gallons) of fresh water and hang it in a tree. It will filter that amount in two hours. Why do you need a backpacker stove? You are camped in a very nice BC campground. Beautiful day with the sun in the sky and the birds singing in the trees. What a great day for a nice hike. Why not take along a small day pack with snacks, fruit etc. Why not a nice cup of coffee or tea.Include this in your camping equipment list. A lightweight stove along with a tea pot and you are all set. We use one of these and they are amazing. One morning, while camping with our daughter and son in law at Kathleen Lake in the Yukon Territory, we had to prepare breakfast in a nice lakeside shelter.It was really cold that morning. The wood for the wood heater was wet. We set this little stove on top of the cold heater and had breakfast for four in minutes. Shortly, two European couples entered and attempted to get the fire going. Couldn’t. They had this large cast iron fry-pan but no heat. We offered ours and they were totally amazed and sat down to eat in ten minutes. 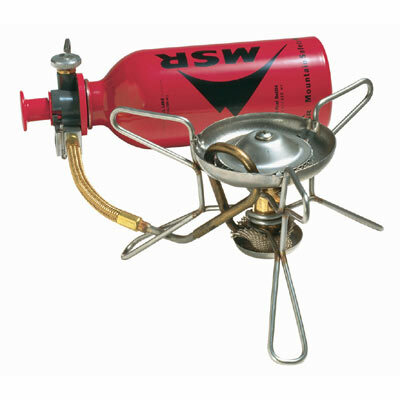 Check here to see how to use a Whisperlite Stove. For the final item on the camping equipment list we include a SS teapot, one liter size. A perfect companion for the lightweight stove. Tough. A good backpacking sleeping bag will be lightweight but for the cooler weather you may wan to carry a sleeping bag liner. 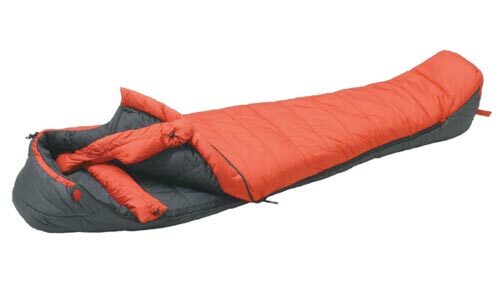 Check sleeping bag reviews for advice before you purchase. It is hard to beat small camping trailers or a small lightweight travel trailer as you may take them anywhere and are easy to tow. Reese trailer hitches are possibly not requires for the light ones. Reese fifth wheel hitches are a must though for the larger units.